Today’s post is the result of a recent conversation I had around the definition of cloud computing. If you’ve ever wanted to know more about the cloud, or you’ve tried to learn and got a bit frustrated, then this is the post for you. If you’ve ever wanted to know more about the cloud, or you’ve tried to learn and got a bit frustrated, then sit back and read awhile ’cause this is the post for you. Back in April I was contacted by Kevin Arnot, a college senior who was writing his bachelor’s thesis (he was studying in the US but officially attending a German University so he needed to write an undergraduate thesis to graduate). Kevin’s thesis was tentatively titled, “Demystifying the Cloud” which immediately caught my interest. Why don’t more people understand the cloud and what it offers? Answering that question, and providing a solution, is the goal of this post. If you’ve read this blog for any length of time you’ll know that this subject is near and dear to my heart. I’ve created a lot of content about the cloud and that’s how Kevin found me (he saw my “What is the Cloud (now with pictures! )?” video over on YouTube). Anyways, Kevin and I sat down to chat over the phone. It was a good conversation – we were both happy to find a comrade in the fight to make the cloud more clearly understood by all. Over the course of the conversation, Kevin and I discussed many points, but one stood out more than the rest: “Why don’t more people understand the cloud and what it offers?”. Answering that question, and providing a solution, is the goal of the rest of the post. You might get more out of this post if you watch my, “What is the Cloud (now with pictures! )?” video beforehand. To that end, I’ve embedded the video below. This is not required – it’s just a suggestion. You may also want to work your way through my small business guide, “Why Use Online Software?” to better understand the benefits that the cloud provides to business as well as the concerns, such as security, that businesses have about the cloud. “The cloud is made up of all the services that vendors offer both businesses and consumers over the Internet”. The rest of our conversation examined why this perfectly clear explanation was essentially useless. Online storage for an individual’s files and music? That’s the cloud. Powerful servers hosted offsite to run a company’s proprietary business software? That’s the cloud, too. Large file transfer that allows individuals to send their videos of their kids to the grandparents? Once again, the cloud. Online software for managing a business? The cloud. Online network management? The cloud. Each of the bullets above describes a service that some vendor provides via the cloud. In truth, there are way too many of these services to list here, and that’s the root of the problem. If I told you Bob was hired to cook meals for a family, you might call him a chef. If I then told you that Bob also cleaned the family’s house you might call him a housekeeper. But what if Bob also did people’s taxes, worked at a moving company and was a doctor at the local clinic? You might call Bob crazy, but that aside, there’s really no one word that you can use to describe what he does. Are you starting to see why the cloud is a concept that’s hard for many folks to grasp? It’s just too big and made up of too many parts! What was wrong with the definition of cloud computing that I articulated above? It was just too general! 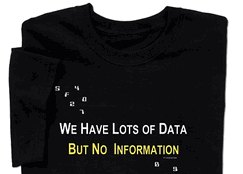 The word “Cloud” reminds me of a t-shirt I own that says, “We Have Lots of Data But No Information”. This describes the term “cloud” perfectly. Data without context cannot become meaningful information. Any explanation of the cloud without context is useless. To use another example, explaining the cloud without any context is like saying, “I’m religious” without explaining your beliefs nor how strongly you believe in them. “Religion” is another big concept; one that encompasses so many things that, like the cloud, it’s almost meaningless when used out of context. Even even when broken into separate “parts” the cloud can be hard to understand. To combat the sheer size of the “cloud” concept, folks have created many terms to describe its different parts. 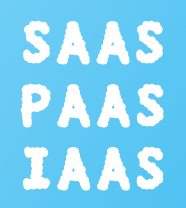 This is how we wound up with terms such as IAAS (infrastructure-as-a-service), SAAS (software-as-a-service) and PAAS (platform-as-a-service). While it’s OK to break down the cloud along these lines, once again we often lack context. Case in point – there are many, many scenarios that cover more that one of the three terms above. One example is Dropbox, an online vendor that allows folks to store, and share, their files online. This could fall under IAAS because it gives a spot for online storage but it can also fall under SAAS because there is functionality built into their system. How can non-technical folks hope to make enough sense out of this to make a business decision? Those who want use the cloud effectively need to understand what the cloud is all about. You need to learn about the cloud and that’s where Kevin’s thesis comes in. In other words, to make effective decisions about the cloud, you need to understand the cloud and to understand the cloud, you need to take the time to learn about the cloud. I heard that groan! Well, don’t worry because this is where Kevin’s thesis comes in. The title of Kevin completed thesis is, “Demystifying the Cloud – Drawing the Lines between Technologies and Concepts”. I’ve embedded a copy for your use below. I highly recommend giving the paper a read as there’s a ton of useful information inside including easy-to-understand definitions, business benefits and much, much more. Kevin also describes cloud-based challenges that individuals and businesses may have to deal with equally and reviews possible solutions. Even better, the thesis was written so that non-techies can understand and make use of what they read. Reading this document will help you understand the cloud and that’s the key to making effective decisions about the cloud. So grab a cuppa’ joe (or if you’re like me, a Diet Coke), lean back and enjoy the fruits of Kevin’s hard work. he received a grade of 4.0 out of 4.0 (great work Kevin!). NOTE: Don’t be scared-off by any German you may come across. The bulk of the paper (including all the useful info) is in English. 14 Social Media Tools Used by Marketing Pros: A handy roundup of the latest social media tools for tracking, scheduling, curating and more. Gonna’ check these out myself! Making connections: how Kimberly-Clark embraced social media marketing: Love these real-world case studies! Can You Run a B2B Marketing Campaign Without Google? : Insightful look at B2B inbound marketing beyond Google. 20 Ways To Drive More Traffic To Your Blog: Advice you use today to increase your blog’s traffic. Optimize Your Website Content with Calls to Action: Tips for Small Businesses: Website traffic means nothing if it’s not driven to conversions. Here’s some tips on how to create calls-to-action that drive conversion. Adjust How You Think About Content (It Could Actually Lessen Your Workload): Some useful tips on efficiently using content marketing. 3 Ways to Use Online Video in Small Business Marketing: 3 ideas for increasing the value of your online videos. 5 Reasons Why You Need an Email Newsletter: If you’re asking, “Why Should I Use E-Mail Marketing?”, this post will answer the question. 9 Examples of Brands Engaging in Social Media Banter: Slinging social media updates over brand fences is catching on as a new attention-grabbing tactic. How about this, just as a starting point. Using the cloud is borrowing someone else’s computing power over the internet to accomplish what you want to do. That definition would work if I was interested in IAAS or even PAAS, but it doesn’t really mention functionality which is the core of SAAS. As I maintained in the post, I believe that a simple explanation won’t do because the cloud is just too complex to boil-down in a meaningful way. Thus – it’s all about context.